We had this crazy idea to embrace our Capitol City of Richmond, and most especially the James River that flows through it. How about a big cleanup? We can turn it into a big party! Even better – let’s all jump in the James to celebrate! AND LET’S DO IT IN THE MIDDLE OF THE WINTER! Our first Shiver in the River was a great success. In our second year, 350 people registered for a new 5K Walk/Run, allowing many to enjoy the scenic beauty on and around the James. Last year, 535 people registered for the 5K, 488 volunteered and gathered over a ton of trash and recyclables, and 183 hearty folks did the James River Jump. We had music, food, dogs, kids, drones, and beautiful sunshine to dull the cold. It’s truly become Virginia’s Coolest Winter Festival. This year’s Shiver in the River is February 24th, and we have a great deal for you! 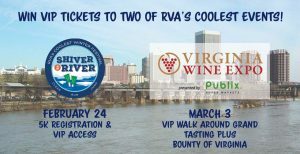 Follow This Link to register to win – not one but – TWO VIP passes to – not one but – TWO of Virginia’s signature events! 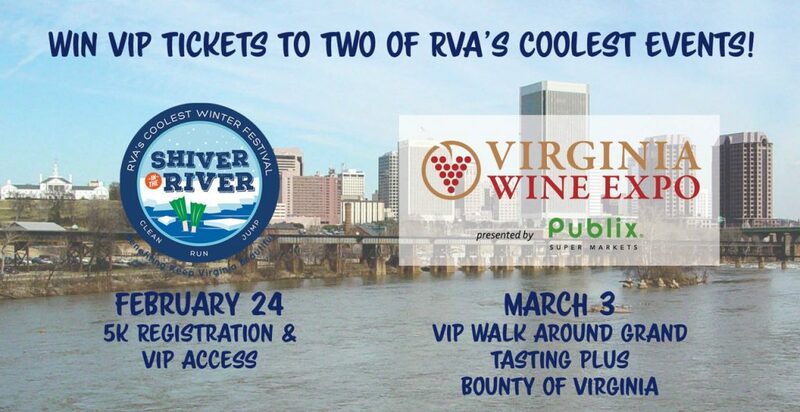 You’ll be entered to win two VIP access passes and two 5K entries to Shiver in the River on the 24th, and two VIP Walking Around Grand Tasting Plus Bounty of Virginia to the Virginia Wine Expo on March 3rd! You need to be 21 to enter, but it’s worth it! Nobody likes to Shiver or drink wine alone, so tag a friend you would love to shiver with! If you use the hashtag #Shiver18 on Facebook, Twitter, or Instagram, you’ll be entered TWICE! You have to register first, and then share the contest URL, including the #Shiver18 hashtag. Now, REGISTER! And we’ll see you at Shiver in the River! VERY cool. I am so glad I found this before the day was over. Thank you for offering this and for the work you do in our community!